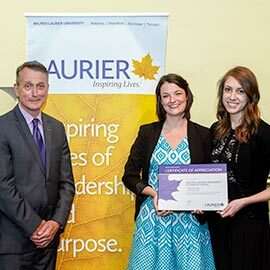 Laurier’s most generous donors were celebrated at a special event hosted by Development and Alumni Relations on May 25. “We are here to say thank you and to celebrate you,” said Rob Donelson, vice-president of Development and Alumni Relations, who served as the evening’s master of ceremonies. A highlight of the event was the presentation of the 2015 Laurier Society Philanthropy Awards. Recipient Barry Schneider (’65) was recognized for his deep-seated dedication to Laurier. Through his generosity, which includes both annual donations and a legacy gift outlined in his will, Barry demonstrates a loyal devotion to helping Laurier. Ian McLean (’98) and Hilary McLean (’99) were also named recipients of the award. This couple has made significant investments to encourage and enable science entrepreneurship at Laurier. Their donations have provided seed funding for Laurier’s Entrepreneurship in Science course and supported the first entrepreneurship course aimed specifically at science students. The evening’s celebration also highlighted the many important ways that donations help Laurier go beyond the classroom. Students who have participated in some of Laurier’s exceptional integrated and engaged learning opportunities shared their experiences. Hearing first hand from students how donations impact their experience highlighted the margin of excellence enabled by Laurier’s donors.